The tactics casinos use to keep players making bets until they leave at a loss are coming to your online shopping experience. Have you ever made a decision not to buy a product, and then found yourself having a last-minute change of mind? Or have you decided to buy online, taking it as far as the “Buy Now” button–and then changed your mind, left the site, only to receive an email promising an additional 15% discount enticing you to close the deal? If so, you’ve been more than brandwashed. Some years ago, I was invited to Las Vegas to witness some behind-the-scenes action at one of the most successful casinos in the world. I was somewhat familiar with the advanced mechanisms of persuasion in operation, but what I wasn’t prepared for was the depth of understanding the casino has on our irrational gaming behavior. This knowledge is well-leveraged, leading the average punter to gamble beyond their original intention. I learned that slot machines with the highest win rate are always placed opposite the elevators. This is the area of major traffic and, as such, becomes an important display point, helping to retain gamblers on their way out. After all, there’s no better way to hold them than with frequent sounds of jackpot wins. This is the object of the exercise. First, attract the guest. Then get them to spend as much time as possible inside the casino. Service areas like restrooms and restaurants are all placed at the back, drawing you into the elaborate labyrinth of slot machines and gaming tables. That ensures, as you head for the exit, that your path will be littered by the excited sounds of people winning, thus prompting you to reconsider leaving just as Lady Luck is arriving. They’re betting on you thinking the next win could very well be yours! One of my greatest surprises was the casino’s No Exit program. It is a simple, yet highly sophisticated program enabling casinos to convert winners on their way out into eleventh-hour profit-generating patrons. At the casino I was visiting, they had a dedicated room for it, indicating the importance they place on this aspect of the business. They referred to the room as the “Last Stop,” and what went on in this room reads like a B-grade movie script. Sitting in the Last Stop was a young man playing blackjack. Judging by the stack of chips in front of him, he was way ahead of the house. Now, as we all know, each table is scrutinized and filmed by close circuit cameras. And, in a room full of monitors in the bowels of the building, there is a highly skilled team assigned to observe the body language of all those who are winning. They can predict with approximately 90% accuracy which winner is about to leave. I was soon told that the young man in question was about to leave. This left me puzzled because to my untrained eye it looked like he was still in the process of capitalizing on his winning streak. They pointed to the way he was scratching his left leg. Over the course of three hours, they’d studied him, and it seems every time he scratched his left leg, he’d shortly headed for the washroom. The problem here was that he’d only just been. So those scratches were interpreted as a sign of discomfort, indicating he was ready to move on. At that point, the No Exit program sprang into action. With not much more than a flick of the button, a glamorous couple joins the table, the seductively dressed woman positioning herself beside our winner. Shortly she begins to engage him, charming him with flattery and wit. Her partner takes a quieter, more polite approach. There’s no reason for the winner to suspect they’re anything other than fellow patrons. The truth of the matter is they’re working for the No Exit team and their aim is to lure the winner into another room to continue playing. The woman, whom I’ll call Rebecca, convinces the young man that his winning streak is bound to continue if he heads to the roulette table and bets on 36, her lucky number. He’s sold. He stops scratching his leg and, reinvigorated, they head off to place his bet. So far, so good. The next stage is about to kick in. Shortly after they’re seated, a waiter carrying a tray of colorful cocktails comes to the table. Our winner hasn’t touched a drop of alcohol all night, but succumbs to what Rebecca calls her treat. He starts sipping on a whisky sour. Bingo! The casino has won. They tell me at this stage there’s now a 75% probability that our winner will leave a loser. Sadly, the psychology behind the casino’s maneuvering is not much different from that email offering us a further discount to go and complete our online purchase. The complex understanding of gambling behavior is now being applied beyond the Las Vegas perimeter. 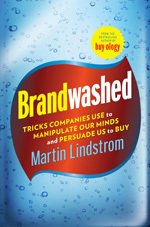 As I point out in my latest book Brandwashed, gambling will soon serve as the primary model for most online shopping sites. Think of eBay, where the countdown puts an urgency on the purchase, or gilt.com, which puts the pressure on by making one more fabulous offer just as you’re about to close the deal and exit. Then there are sites like QVC, which encourage you to “keep calling even though our lines are busy.” Indirectly, they’re letting you know that this is your last chance to cash in on their latest, most amazing deal. The bigger question, however, is not how the principles of gambling are being applied to shopping but, rather, are we in fact becoming a nation of gamblers? After my visit to the casino, I’m convinced we’ve only just seen the beginning. Should we bet on it?